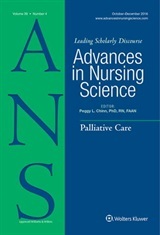 In August, the International Academy of Nursing Editors (INANE) is holding our annual conference in San Francisco at the Sir Francis Drake hotel. Nursing journal editors worldwide attend this conference each year to discuss issues related to publishing nursing literature, to meet with other editors and publishers, and to learn the latest advances in publishing. Our common focus, regardless of the nature of the various nursing journals, is how to improve the quality of nursing literature and enhance our service to the profession. This year the conference will be focusing on social networking media, and how new networking tools on the internet can enhance the missions of each of our journals. If you have been following the latest developments related to ANS, and if you are reading this blog, you will already be aware of ways that we are tuning in to the world of social networking! Not only do we now have this blog; we also have a presence on Facebook and Twitter! Why social media for a nursing journal? Social media helps to broadcast and promote what we offer in nursing literature. But the most important reason from my perspective as the Editor of ANS is that social media offers you a way to be involved. A web site is essential, but a web site is like reading the journal – you take it in, but cannot directly interact with the site. Our blog offers an avenue for ANS readers to interact, to participate actively in the journal and its mission. Any ANS reader can become a contributor to the blog. As a contributor you are welcome to offer commentary on articles published in the journal, and issues related to the development of nursing scholarship. Blog posts are not peer reviewed; they are previewed and approved by the editorial administrators of the blog. If you are interested in becoming active as an ANS blog contributor, please let me know! ← ANS online and on paper: is there a difference?